Our proven Dual Jet engineering is now complemented with a streamlined nozzle design offering a full drying experience with comfort and speed. The drying speed is proportional to airflow and volume so with the high air volume of 3.6m3/min, Jet Towel offers you the speed while maintaining a mild and comfortable airflow rate of 80m/sec. It is easy to place your hands in position amongst the jets of air, causing no danger to children or users with small hands. The Jet Towel has nothing to refill or replace (unlike paper or cloth towel dispensers) and no waste paper to pile up or dispose of. 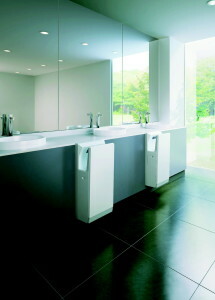 This will give a clean, tidy and professional feel to your bathroom. The hand-drying area is made of alcohol-resistant resin, enabling cleaning using standard alcohol-based products. Also with antimicrobial treatment on areas that come into contact with water (hand-drying area, drain tank and drain hose), the unit itself is designed for ultimate hygiene and cleanliness. When the hands are fully inserted, lower sensor detection starts the airflow. Withdrawing the hands automatically halts operation. This touch-free design makes it superbly hygienic. The Jet Towel’s drain tank system captures water allowing for easy and convenient disposal of the waste water from hands. The floor and surrounding surfaces stay clean and dry as a result. This drain tank system is preferable to other hand dryers that turn waste water into a mist for direct release into the room, potentially encouraging the growth of unsightly and foul smelling fungi on the floor and water surfaces. Mitsubishi uses silver ion technology which provides anti-microbial protection to the Jet Towel user. All parts that come into contact with water are made from an antimicrobial material. 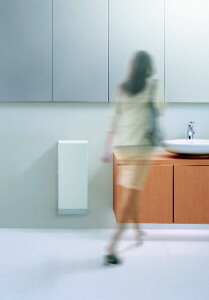 The Jet Towel filter has been designed for optimum ease of maintenance. Unlike other similar products that are prone to clogging which embed bacteria, the Jet Towel filter does not; built-in alcohol resistance makes it easy to keep clean. Advanced design ensures that the airflow is always fresh and dry. Inserting the hands triggers a stream of fresh air from the air-ducts, drying with maximum speed and comfort. the problem of mutual interference noise between air currents. Customers can select the optimum operation mode, tailored to specific installation locations. The money spent to dry a pair of hands with a paper towel could dry up to 100 pairs with a Jet Towel. After installation, it is much cheaper than paper-towel dispensers or cloth towels. Also, the 550W motor (under half that of direct competitors) means Jet Towel achieves a huge reduction in energy costs. Use our Cost Saving Calculator and see how much you can save. Jet Towels turns on and off automatically, avoiding unnecessary over-running. When the hands are fully inserted, lower sensor detection starts the airflow. Withdrawing the hands triggering the upper sensors into automatically halting operation. It will stop in 30 seconds even if hands are not withdrawn. The Jet Towel is easy to clean and maintain. The hand-drying area is made of alcohol-resistant resin, allowing for cleaning using standard alcohol-based products. The Jet Towel has antimicrobial treatment on areas that come into contact with water (hand-drying area, drain tank and drain hose) and uses a high durability brushless DC motor which ensures a long operational life with low maintenance. There is no bigger trend facing operators today than creating environment friendly facilities. Aside from the significant cost savings, when the choice is made to install a Jet Towel hand dryer a statement is being made that less waste, less carbon dioxide, less use of natural resources and cleanliness are all paramount to your operating mission. It quickly adds up. If the waste paper were piled up, it would reach 28 meters per month, or 336 meters per year, or roughly the height of an 80-story building. In terms of Carbon Dioxide, a Jet Towel uses 650W, compared to 2200W by the regular dryer. With a rough estimation, the reduced power use would mean a reduction of 1300kg of CO2 per year, which is equal to boiling a kettle for 18 years or running a tumble dryer for 8 years. A slim design blends form and function, with the front panel angled gently outward to allow the user to stand comfortably and naturally when inserting their hands. The open sides allow for easier access. Great care has been taken to angle the air nozzles and position the sensors so as to prevent any water splashing upward. Thanks to its special nozzles, Jet Towel has a high volume air flow with not too high air speed. It is completely safe to use for children with small hands. The area to insert hands provides ample room to insert/withdraw hands. Open ends on two sides enables easy hand access from the side without touching the unit or getting trapped whilst wearing watches/jewellery. Conventional wall-mounted hand dryers can cause problems for young children. The loud operating noise can be intimidating and unpleasant, discouraging children from following the correct hygiene procedures and forming bad habits. Jet Towel is quiet at 58-61 dB, the same volume as a conversation. Its sleek design and blue lighting holds a novelty value with young children, giving them a positive, engaging experience and reinforcing good bathroom hygiene habits.